The offload can be one of the most exciting and rewarding skills in the game of Rugby Union. The ability to deliver an accurate pass while in contact with the enemy is an art form in itself, and leads to high proportion of line break successes for the attacking side who can it execute well. The idea is that attacking play remains fluid and continuous just as the defence is preparing to stop and reset for another phase. The defenders think that the ball is momentarily ‘dead’ after a tackle has been made and that there will be an opportunity to regroup. The offload shows unexpectedly that this will not be the case, and in that small moment there is a chink of light for the attack. Offloading is a particularly valuable skill for teams who know that they will not go into most games with an advantage in physical size and power over their opponents. They need to compensate instead with better quickness and sharper skills when they approach contact. The keys are good ‘last-minute’ evasion technique, an ability to keep the ball available, and to give and accurate pass using only one hand. This suits the dynamic of the professional game as a whole, which is finding ways to introduce the principles of unstructured rugby earlier into orderly routines from set-piece. Japan is one rugby nation which has never been able to rely on its advantages in size or power, so it is no surprise that Japan outside-half Kyohei Morita gives such an excellent, lucid introduction to the art of offloading in his new module. In his module, Morita creates easy exercises designed to increase the accuracy of one-handed passing, and develop the evasive skills required to move away from the point of contact and keep the ball available to support. 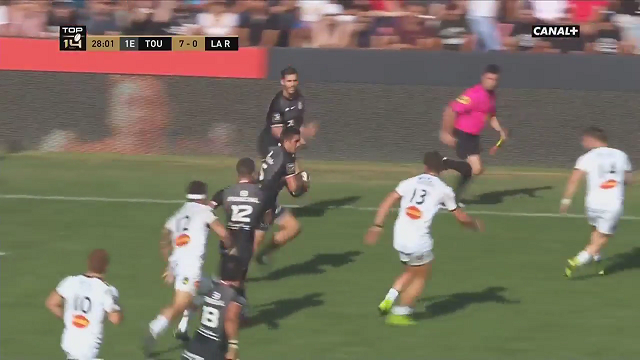 Some excellent examples of how these skills can be applied occurred in a recent match from the Top 14 league in France, between Toulouse and La Rochelle. The Toulouse full-back Thomas Ramos is young and he is not very big at 5’10 inches and only 85 kilos, but he demonstrated the kind of offloading skills that Kyohei Morita would appreciate and applaud. The move is a straightforward ‘8-9 right’ off the base with the key moment arising when Ramos receives the ball on the end of the second pass. Ramos uses his evasive skills to move away from the tackler and deliver one of the two types of offload Morita highlights in his module – the ‘side door’ offload out of the back of the right hand. Ramos runs on a line straight towards the last defender, to commit him to the tackle and give him no chance of recovery. If Toulouse right wing Yoann Huget is able to hang on to the ball, there would be clear space for him to exploit down the side-line. The second example occurred later in the half from another scrum, this time on the right side of the field. If Ramos takes the outside he will be tackled, and the player on his left is also well covered, so there is no overlap available. It is at this moment that the Toulouse number 15 plays his joker, setting up the offload scenario. He takes the tackle but uses his right arm to fend and maintain the distance between the defender and the ball, which means that it is available to the support runners and allows a pass to be made through contact. The pass is Morita’s second type, a ‘hooked’ underarm offload given to a support player running on the inside. This time there is no fumble from the receiver of a Ramos offload, and the end product is a spectacular try at the opposite end of the field! Although the scenario is a ‘structured’ phase from set-piece, the attacking philosophy is not to use the opportunity to create a sophisticated back-line ploy with different lines of running and decoys ahead of the ball. It is simply to give the ball to the best off-loader and let him work on the man opposite with his skills – then flood the support channels when the ball goes through the line behind the back of the defender. It is perhaps ironic that this would probably register as a completed tackle on the statistical spreadsheets of the coaches, even though the offload has converted a tackle completion into its opposite – a clean break! But maybe that is a sign of the new direction in the world of rugby.